Over a period of three years, 1994 to 1997, I consulted to an organisation providing residential care for men and women with mental health disabilities. This was in the middle of the changes taking place in the UK to introduce ‘internal markets’ and the de-institutionalisation deemed necessary to providing ‘Care in the Community’. The work was undertaken together with Barry Palmer, and presented at the 1997 ISPSO Annual Meeting in Philadelphia under the title The Architecture of Quality. The work established a way of enabling the organisation to adapt its work to this newly emerging environment in which the proactive pursuit of individuals’ care in the community could be put first. It did this by tackling the north-south bias in the architecture of the organisation and establishing the need for asymmetric forms of leadership capable of realising east-west dominant forms of governance. dealing with a whole lot of compliance issues for which historically they knew accountability could be reliably ‘delegated’, but would no longer be able to be ‘delegated’ so easily? I would not want to just look at the Trustees’ behaviour and motivation. I also resisted stepping beyond my know-how. I carried resistance while simultaneously espousing doing different. This is why I think the link to extreme sports is a useful one and perhaps to courage in general. What is it to do the right thing? And how does one ‘know’? I think that ideas have been under-emphasised in any leadership framework. Instead, the emphasis has been on emotional intelligence which, while being important, is just not enough – being ‘good’ does not guarantee that things will work better! There was a parallel process going on from the beginning, in which the CEO was receiving personal support in coping with how he took up this new role, support that had preceded his new role. Having taken up the role as CEO, I was consulting to him concurrently with this other support, my task being to help him develop ways of tackling the leadership challenge he faced. The splitting of these two aspects of support to the CEO – containing anxiety and innovating – paralleled the way support to the organisation was split between the governance task facing the Trustees and the leadership task facing the CEO. The full implications of this split did not become apparent until 2001. Barry and I were not able to work the parallel process effectively. The envisioning of internal markets and de-institutionalisation was accompanied neither by any understanding of how the transition should be managed, nor by any support for the transition itself. The rhetoric was that all this should be ‘left to the market’. Even had we addressed the split in our consultation to the organisation, Trustees and Management together would have had to act very strategically to survive the disruptions to funding that would have arisen during the transition – a transition that is still ongoing! This was because the economics of an east-west dominant organisation are both different to and more complex than those of the north-south dominant form. Yes, we consultants needed to grasp the fundamentally different kind of economics that were being engendered by operating explicitly in a turbulent environment in which residents had to be responded to one-by-one. What I also know now is the investment I had in ego psychology, which Barry perhaps shared. Nailing the attitude to anxiety was one of the most important things noted in both versions of the paper. Any work had to be anchored to making it better for patients, a ‘work’ that we all had to have an investment in. Alongside the paper on The Architecture of Quality, other relevant papers by or with Barry are Meeting the Challenge of the Case (except that in retrospect, the challenge of this case was more than we thought at the time! ), In which the Tavistock paradigm is considered as a discursive practice (thinking about how to situate the approaches associated with Barry’s role with the CEO as manifesting a particular form of discursive practice), and The Tavistock Paradigm: Inside, outside and beyond (laying the foundations for a new set of questions to which we are still trying to find adequate responses). Simon Western addresses these forms of leadership in his writing on eco-leadership. 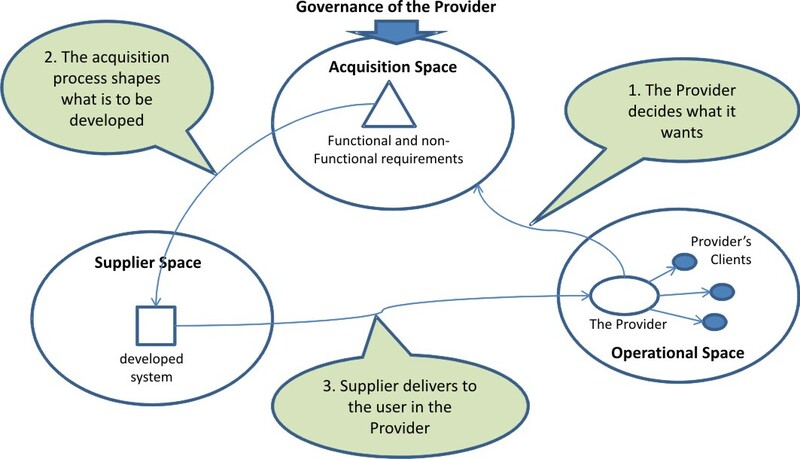 This is a reference to current thinking going on about the role of courage in overcoming defences against innovation – see the conclusion to Counter-resistance is always on the side of the supplier-provider. Which we had nevertheless formulated in 1994 in Meeting the Challenge of the Case, even if we hadn’t realised the extent of it. This comes up as a central issue in facing the future of the psychoanalytic study of organisations. This is to be the focus of a forthcoming paper to be presented at the 2014 Annual Meeting of ISPSO in Santiago – ‘Betraying the citizen: social defences against innovation’. members insist on behaviors based on an understanding of need that is not congruent with their actually experienced needs i.e. in a way that leaves a value deficit/asymmetry. Some such loss of alignment is inevitable in the process of a membership organisation responding to growing demands from its members under conditions in which the environments in which members are operating are also changing. Thus loss of alignment may be because members’ demands ‘on the ground’ either get ahead of or lag behind their leadership. It may also be because members themselves are using models of demand that are unable to account for what they are experiencing. 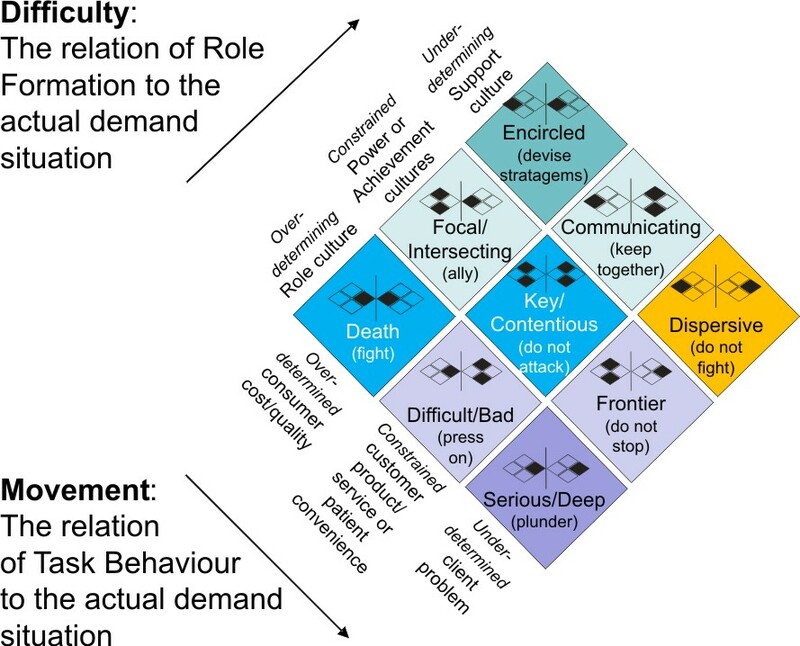 In the latter case, situational resistance describes resistance by members in which their behaviors ‘on the ground’ insist on finding ways of addressing the experienced value deficit, challenging their own current models of demand as well as the leadership’s approach to sustaining the (competitive) identity of the organisation. A response from members that insist on their current models and/or from leadership that aims to conserve the existing models and identifications supported by the organisation is then counter-resistance. 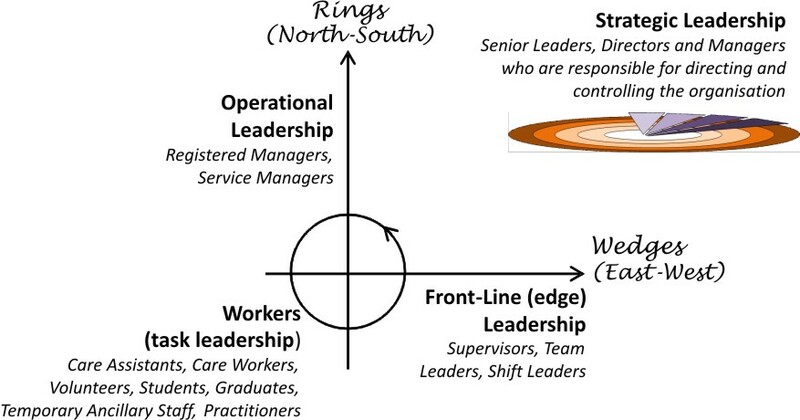 The ‘role culture’ expected by leadership is over-determining of how roles should be taken up by members (lhs), reflecting members’ behaviors being over-determined by the way they understand the nature of the situations they face ‘on the ground’ (rhs) – no choices are left open to role-holders nor are they felt to be needed by members in practice. 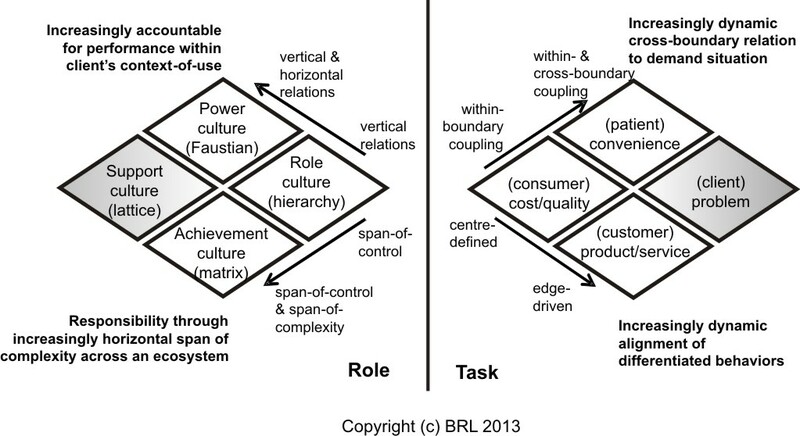 The ‘power’ and ‘achievement cultures’ in which leadership constrains but does not over-determine how roles should be taken up by members (lhs), reflecting members being constrained but not over-determined by the way they understand the nature of the situations they face ‘on the ground’ (rhs) – some choices are left open to role-holders and are felt to be needed by members in practice. 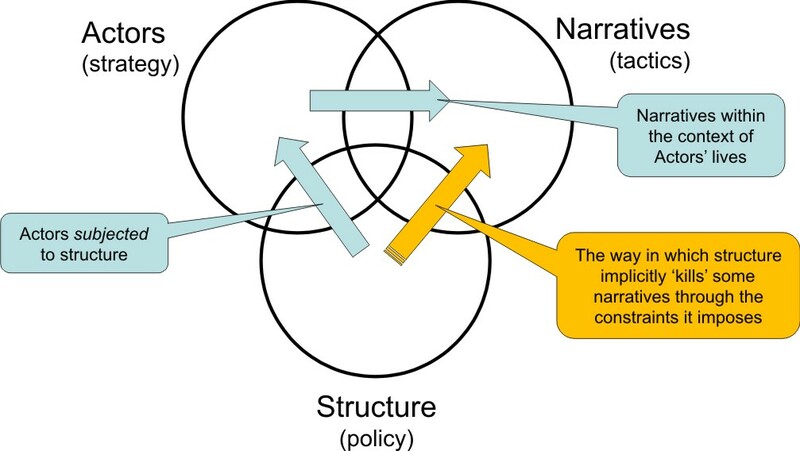 The ‘support culture’ expected by leadership is under-determining of how roles should be taken up by members (lhs), reflecting members’ behaviors needing to be under-determined in the way they understand the nature of the situations they face ‘on the ground’ (rhs) – choices are left open to role-holders, in practice felt to be needing to be held open by members. 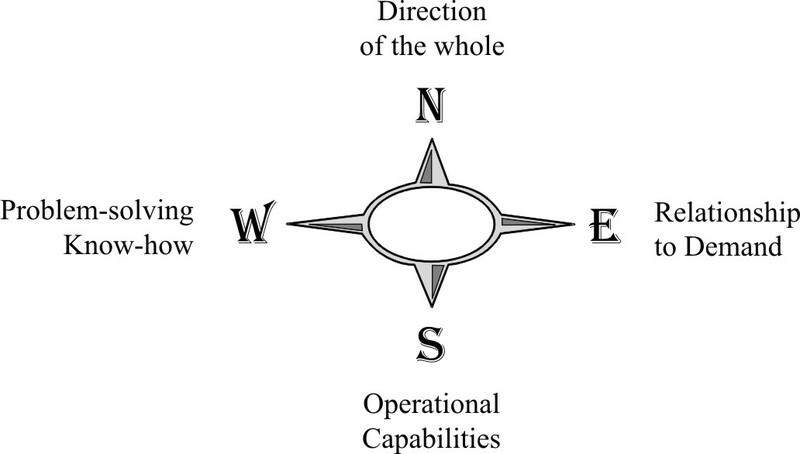 An axis of difficulty defining a relation to the means by which they achieve those ends, being the relation of the support provided by the organisation to its members, through which different forms of support can be provided to members’ behaviors based on the way members relate to the value deficits they face ‘on the ground’. 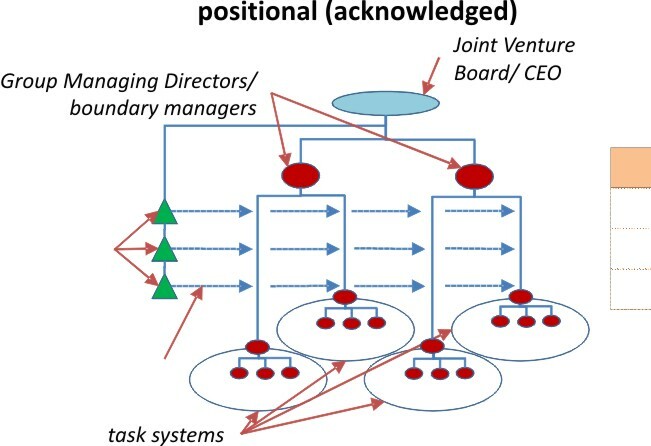 Changes in position within the resultant diagram provide insights into the challenges that the leadership of an organisation faces in responding to changes in its members’ understandings of the demands they face ‘on the ground’, derived from the challenges they face in addressing the value deficits. 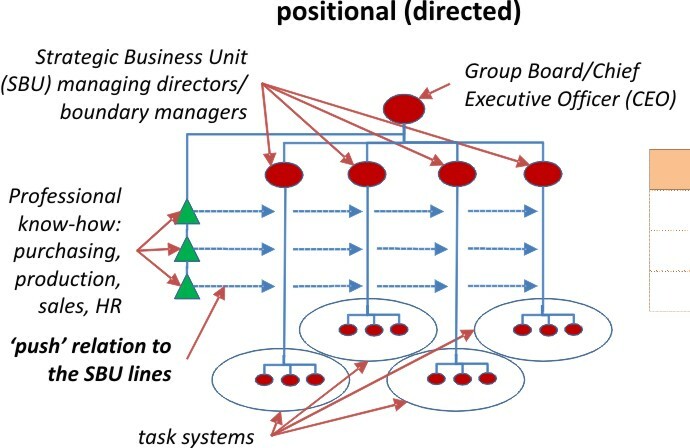 To the extent that the leadership of an organisation seeks to conserve its identity and its members seek to conserve their models of demand (aka exercise counter-resistance), resisting the challenges arising from members’ situational resistance as they pursue value deficits, it is likely that the organisation has become impaled by some previously traumatic alignment. 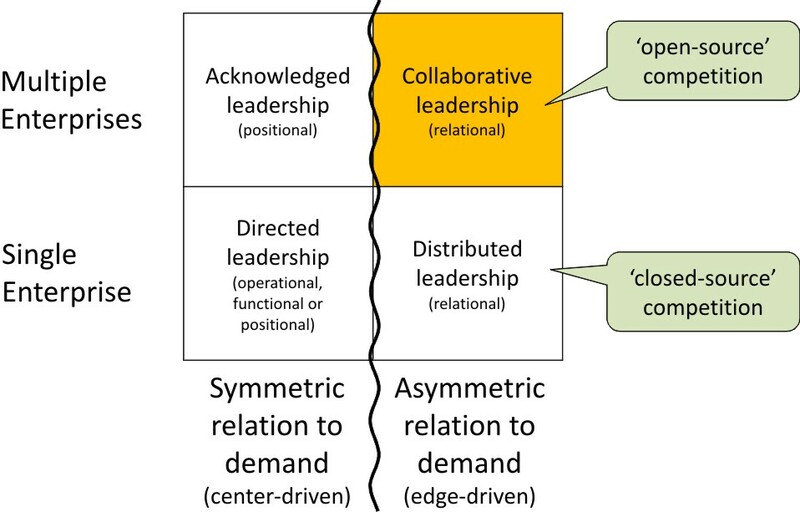 What organisation needs asymmetric and tripartite approaches to leadership? Why engage in triple-loop learning driven by dilemmas in sustaining relationships to individual clients’ demands? What makes action research using plus-one processes so important? 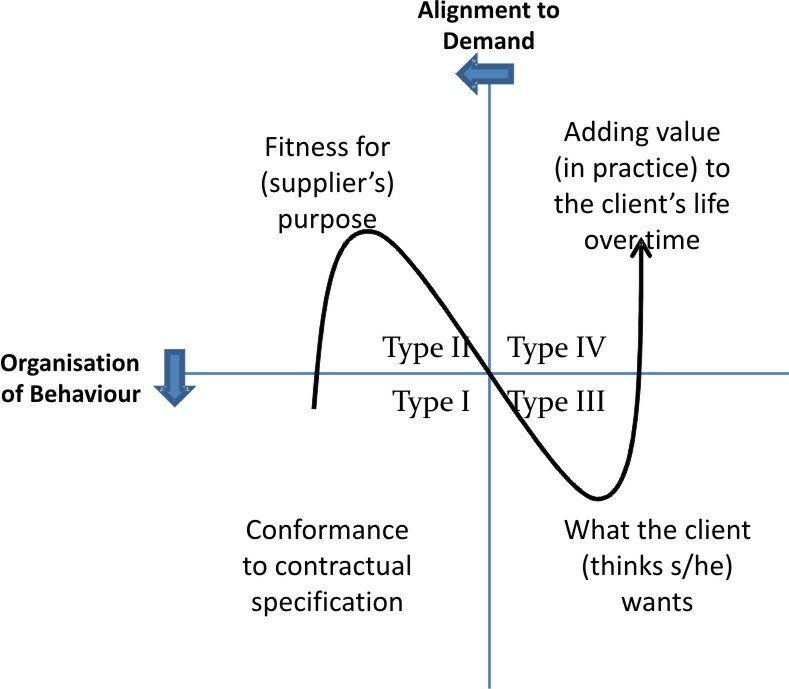 Approached from the drivers of organisational scope, the answer to each question is: any organisation, once responding to the horizontal drivers of performance becomes more important than remaining subject solely to the constraints imposed by its vertical controls, since under these conditions the organisation is in a complex and therefore ‘turbulent‘ environment in which clients must be responded to one-by-one. 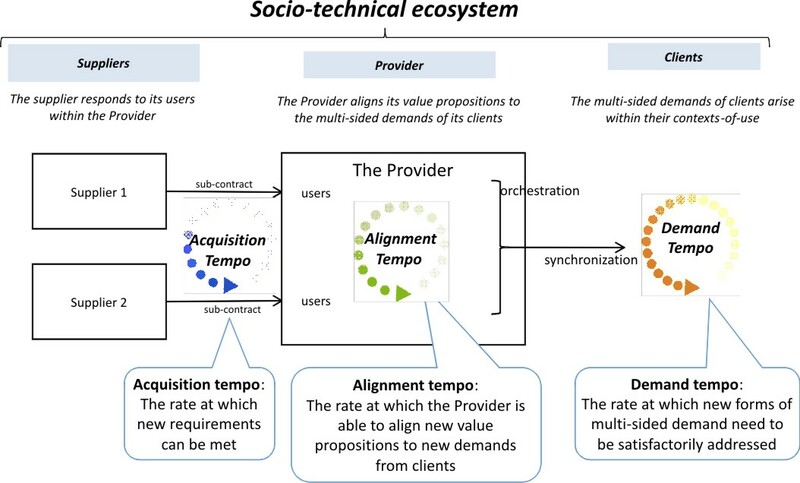 Health and social care are good examples of such an environment, but all industries are moving towards this condition under the influence of information technologies and the increasing prevalence of multi-sided demands, the necessary corollary being the use of platform strategies. Another kind of answer is: “if competition pushes you into the ‘red zone’ in the diagram below”. Role: Either there is no accountability for performance in the demand situation (e.g. performance of the equipment once sold is down to the purchaser), or, if there is, then the accountability is to the person who signed the contract and not to performance within the situation itself (e.g. “if you are not satisfied with my performance, then take it up with my manager and don’t complain to me”). 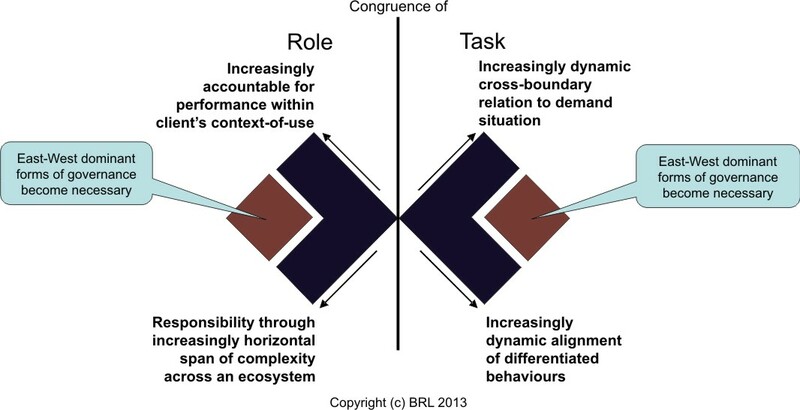 Requisite authority involves there being congruence between the role and task sides of this diagram. Lack of congruence means either too much organisational complexity or inadequate organisational support, depending on which way it goes. 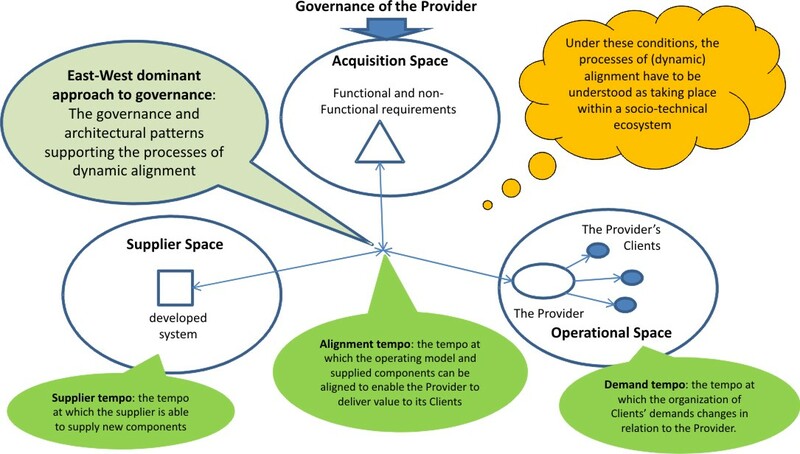 Task: There is a dynamic relationship to the client’s situation that demands the dynamic alignment of differentiated behaviors and that involves dynamic linkages across the boundaries of the organisation (e.g. a care pathway has to be configured and continuously adapted to the needs of the individual client). Role: Responsibility for responding appropriately involves bringing together a number of services from different organisations and holding them accountable in ways that are sustainable and that relate explicitly to performance within the client’s context-of-use (e.g. a care manager responsible for through-life management of the client’s condition and accountable directly to the client). Examining a particular case situation, a hospital group wanted to provide seamless care to patients admitted through their Emergency Department (ED). The task on the right was therefore to provide a condition-centric episode of care, the episodes being designed one-by-one. The problem was that the ED was in a matrix relationship to the specialist wards with which it had to negotiate admission after having admitted the patient to ED. This negotiation was constrained by considerations other than the patient’s condition, such as the receiving ward’s budgets. The proposed solution was to create an ED diagnostic team that had the power to determine where a patient went from ED. The danger with this was that did not provide requisite authority, simply relocated where power was held without addressing the underlying challenges of designing and aligning care pathways that were sustainable across the hospital group’s ecosystem. The solution was to set up a forensic process that could track and evaluate the performance of the ecosystem in order to learn what forms of agility were needed beyond the establishment of the diagnostic team. The outcome from this process was a new organisational capability to backtrack ED admissions and to examine them as symptoms of failure in the primary social and healthcare systems. This led to new ways of managing patients’ chronic conditions and failures in care funding. The multi-sided platform strategies of Apple, Google and Amazon are also good examples of this, as are the failures of Nokia and Blackberry through their continuing pursuit of one-sided strategies in environments demanding multi-sideness. In the previous blog on strategy ceilings, I made reference to architectures as describing the way differentiated behaviors are integrated. How are these architectures to be described? 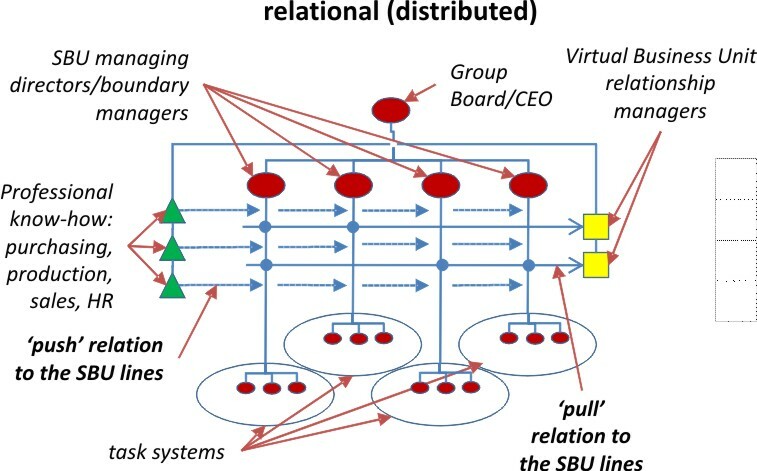 What makes relational architectures different? And what architecturally distinguishes edge-driven collaboration? Thinking of this in terms of rcKP propositions, r-type and c-type propositions can be supplied by an SBU, but K-type or P-type propositions need a Virtual Business Unit capable of aligning multiple products and services to a customer’s demand. This may be done by depending on a Faustian pact with an individual given permission to bend the organisation’s North-South rules because of the scale of the individual contract, or it may involve moving to an East-West dominant form of organisation.